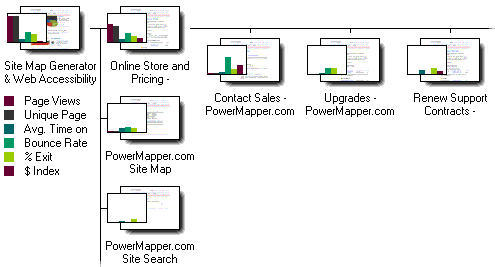 PowerMapper builds a visual site map of web site structure automatically. After mapping, data can be imported from sources like Google Analytics and Webmaster tools to display SEO metrics and visitor data on the sitemap (only available in the Windows desktop version). Site structure can be visualized in a number of different styles, and data can be exported to other tools in Excel CSV format. Building a map is automatic: type in the address, click Map and after a few minutes a map of your web site's structure is produced. Once built, maps can be edited by dragging and dropping.